I had two roasted sweet potatoes left and I wanted to use them before they went bad. I found a recipe for Sweet Potato Cupcakes that won on Cupcake Wars. My leftover sweet potatoes were exactly enough to make the cupcakes. I converted the recipe into a gluten free version and cut the sugar by half. The spicing is perfect, no wonder these won. 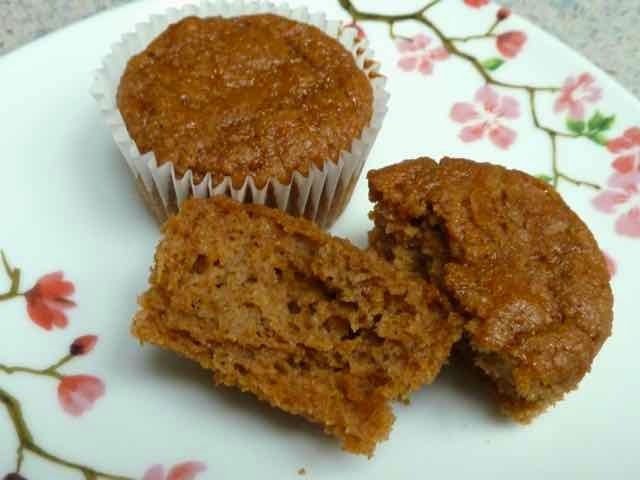 These Sweet Potato Cupcakes are moist, tender and pure heaven. They are similar to a carrot cake. After one taste I decided not to frost them. Just plain, the cupcakes were perfect for me. If I was more ambitious on baking day I would have made some frosting just to see how it would taste. However, since I was perfectly content savoring them unadorned, I did not bother. I have not tried it yet, but I’m sure these would come out great with an egg replacer to make a vegan version. Place the oven rack in the center of the oven. Preheat the oven to 350℉. Line muffin tins with paper liners. 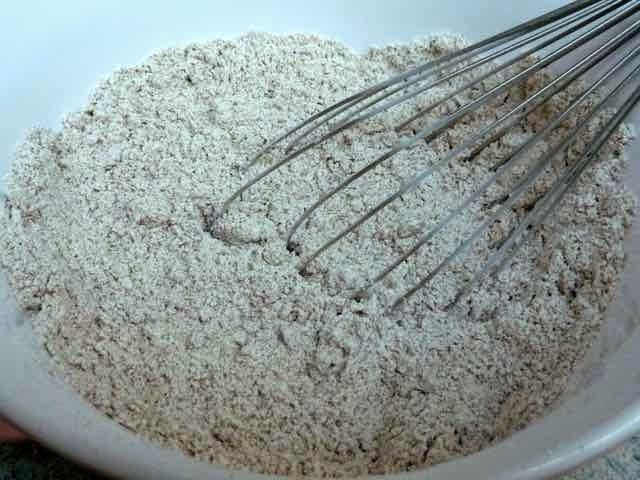 In a medium bowl add the flours, xanthan gum, salt, baking powder, baking soda and spices. Mix well. Set aside. In a large bowl add the cooked & peeled sweet potatoes and mash them until smooth. 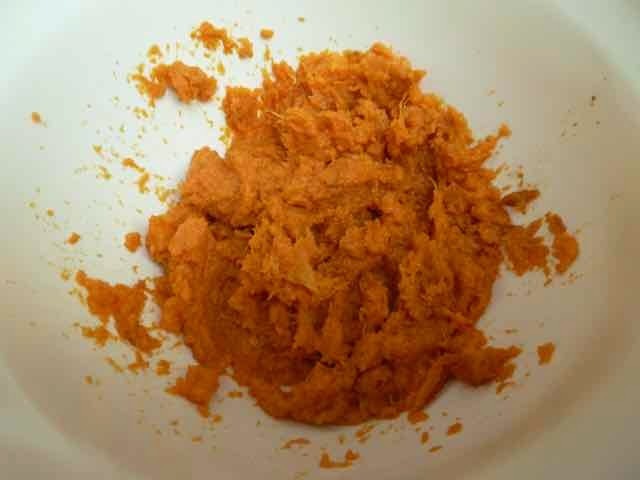 Cooked sweet potatoes mashed in the bowl. Add the oil, applesauce, sugars and eggs. Mix well. The wet ingredients in the bowl. The wet ingredients all mixed. Add the flour mixture, all at once, to the egg mixture. Stir together until just combined. Dry ingredients added all at once to the wet ones. 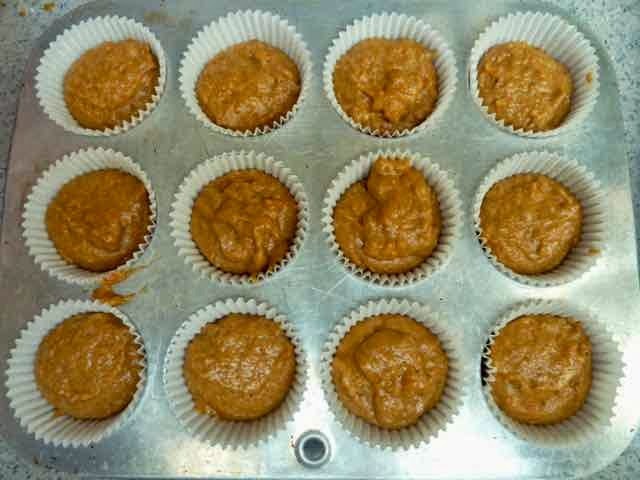 Using a scoop that measures 2-inches across, scoop out batter into the prepared muffin tins. Scooping out the mixed batter. Raw batter int he prepared muffin tin. Bake in the center of the preheated oven for 20-25 minutes or until the cake springs back when gently touched with a finger. Cool in the pan a few minutes and then transfer to a baking rack to cool completely. They are very delightful plain, but, if you want to guild the lily, a cream cheese frosting will go perfectly with these cupcakes. Below is my recipe for cream cheese frosting. Unsalted Butter at room temperature for dairy free use 2 Tbs. of margarine and 2 Tbs. of shortening. Whole Milk - for dairy free use non dairy milk of choice. 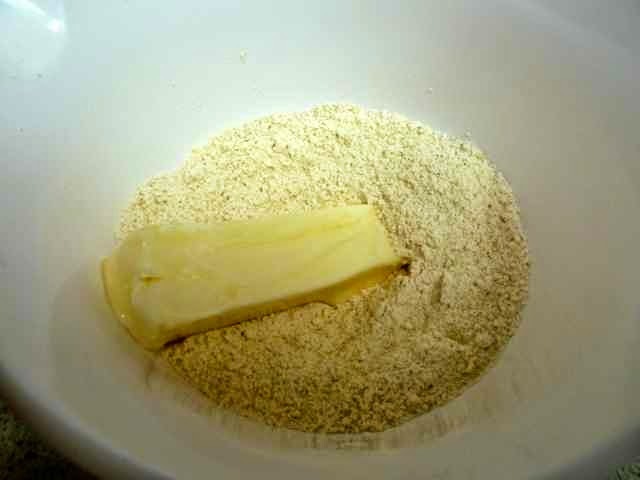 1) Add all the ingredients to a bowl and beat with an electric mixer or by hand until light and fluffy. 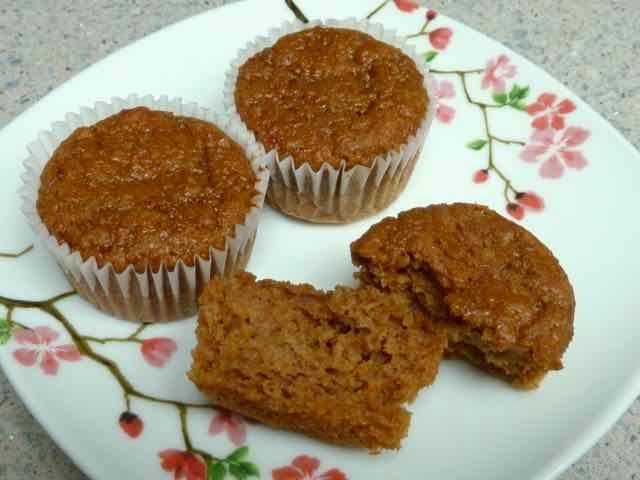 ABSOLUTELY DELICIOUS GLUTEN FREE SWEET POTATO CUPCAKES Makes about 24 Ingredients 1 cup Sorghum Flour 1/2 cup Chickpea Flour 1/2 cup Tapioca Flour 3/4 tsp. Xanthan Gum 1 1/2 tsp. 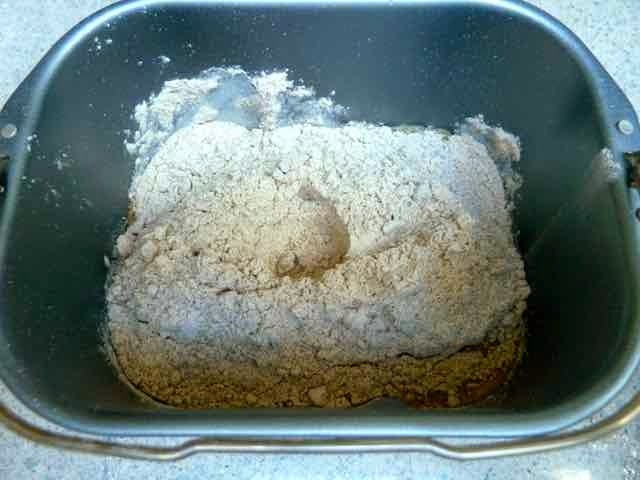 Baking Soda 1 1/2 tsp. Baking Powder 1/2 tsp. Sea Salt 2 tsp. Cinnamon 1/2 tsp. 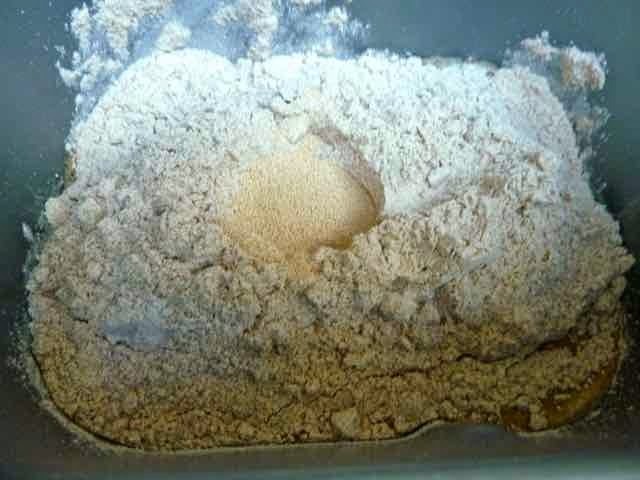 Ginger - dry ground 1/8 tsp. 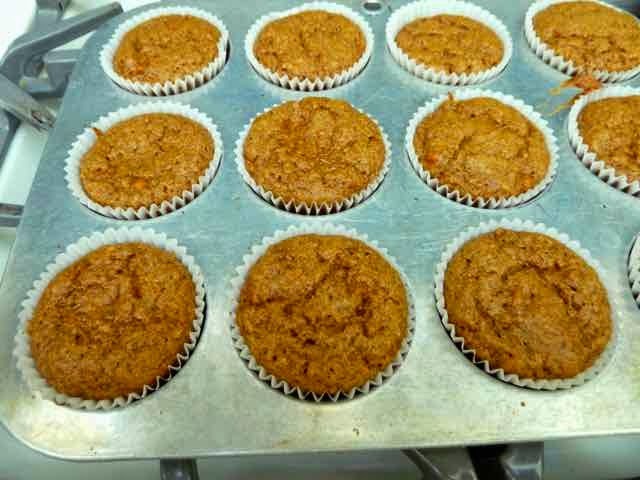 Nutmeg 16 oz./2 cups Sweet Potatoes - cooked and soft 1/2 cup Canola Oil or other mild flavored oil 1/2 cup Applesauce 1/2 cup Brown Sugar 1/2 cup Sugar (I used evaporated cane juice crystals) 4 large Eggs Directions Place the oven rack in the center of the oven. Preheat the oven to 350℉. Line muffin tins with paper liners. 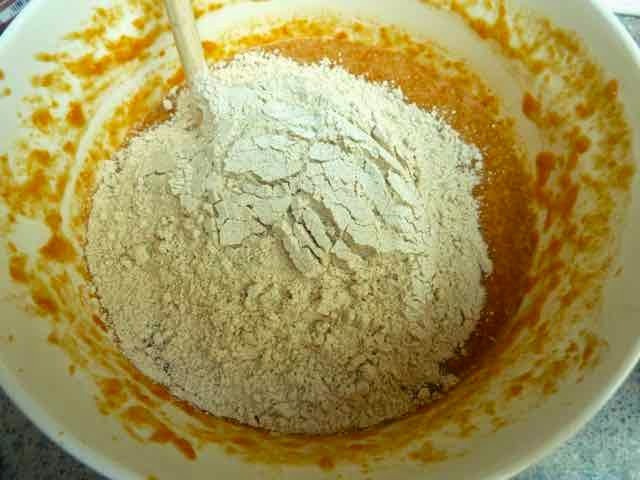 In a medium bowl add the flours, xanthan gum, salt, baking powder, baking soda and spices. Mix well. Set aside. In a large bowl add the cooked & peeled sweet potatoes and mash them until smooth. Add the oil, applesauce, sugars and eggs. Mix well. Add the flour mixture, all at once, to the egg mixture. Stir together until just combined. Using a scoop that measures 2-inches across, scoop out batter into the prepared muffin tins. Bake in the center of the preheated oven for 20-25 minutes or until the cake springs back when gently touched with a finger. Cool in the pan a few minutes and then transfer to a baking rack to cool completely. They are very delightful plain, but, if you want to guild the lily, a cream cheese frosting will go perfectly with these cupcakes. Below is my recipe for cream cheese frosting. Cream Cheese Frosting 16 oz. Cream Cheese at room temperature - for dairy free use non dairy cream cheese 4 Tbs. Unsalted Butter at room temperature for dairy free use 2 Tbs. of margarine and 2 Tbs. of shortening. ½ cup Powdered Sugar - you can adjust this to taste ¼ cup Whole Milk - for dairy free use non dairy milk of choice. 2 tsp. 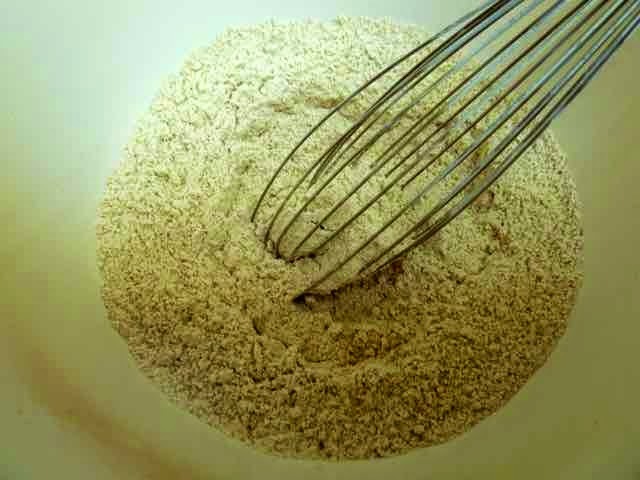 Vanilla extract Directions Add all the ingredients to a bowl and beat with an electric mixer or by hand until light and fluffy. Thanks to my friend, I now have a bread machine (she gave me her old one that was never used). After a thorough cleaning to de-glutinize it, I began to experiment with baking gluten free bread in a machine. Why did I not do this before? So easy, so good, so fresh, so inexpensive, so much better than any store bought bread. 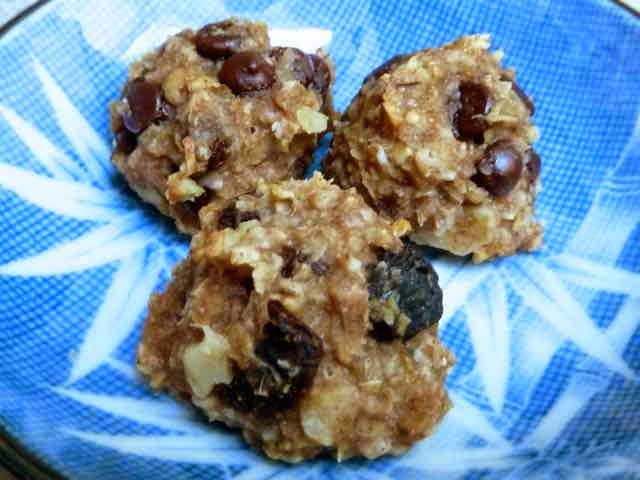 Today I am posting about a great recipe I found on the Gluten Free Real Food blog. 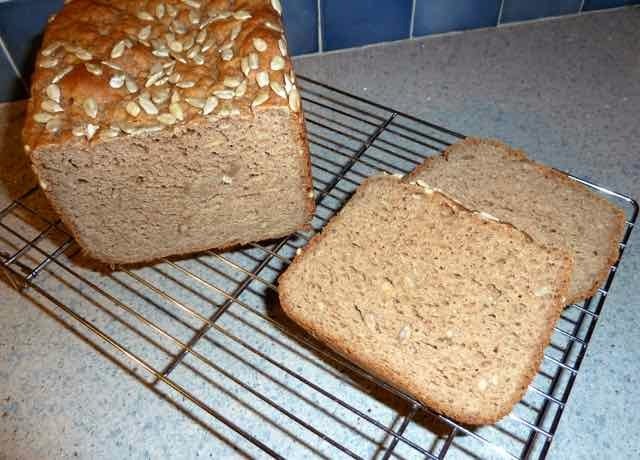 This recipe makes a whole grain artisan type loaf. I followed the recipe as written. The person who created this recipe won first prize at a bread baking contest that was for all bread including wheat based recipes. It can be made dairy free. I love the taste and texture of this loaf. 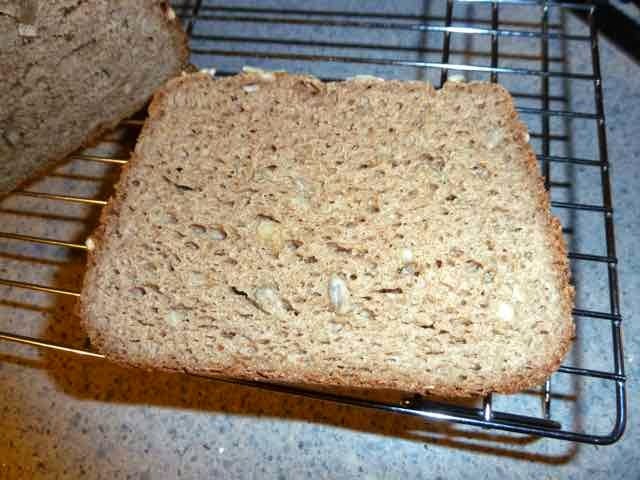 It is not light and fluffy, it is firm and lightly dense like a whole grain bread. I was really missing the hearty whole grain type breads and this fits the bill. You would not know it is GF unless told. I have made this bread quite a few times. My older machine does not allow for customizing a baking cycle and does not have a gluten free bread setting, so I had to experiment. The first time I just let the machine go through the entire “Sweet Bread” cycle, which is closest in recommended times to the recipe. It came out great. Then I decided to cut out some of the time by skipping the punch down and second rise cycle before baking it. The bread came out better this way, a little lighter because gluten free bread does not need that second rise. Punching down the dough only makes it denser. I had to take the loaf pan out of the machine before the punch down cycle. I reset the machine to “Bake”, put the pan back into the machine without locking it in place (to keep the bread from deflating) and let it go through the bake cycle. I set my loaf to “Light” since I do not like a very thick dark crust. 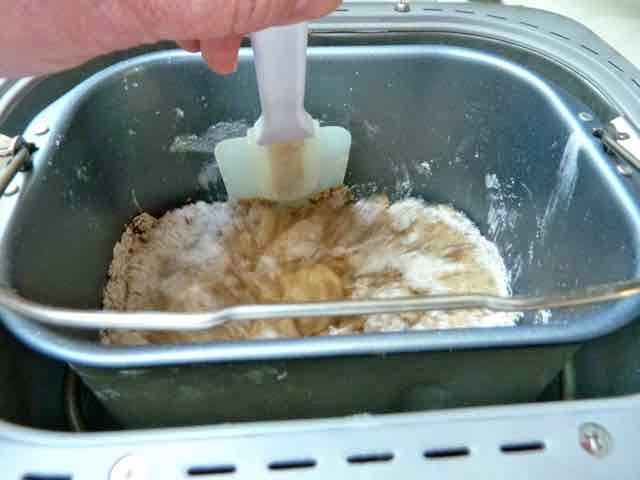 If you have a newer machine that allows you to customize the cycle or that has a gluten free bread cycle you don’t have to worry about all the resetting and taking the loaf out of the pan. If your machine has a GF bread cycle use it with this recipe. If the machine allows customization use the recommended settings. When my machine dies I will definitely get one with a GF cycle to make it even easier to make bread. Meanwhile I am experimenting with other bread machine recipes, so far this one is my favorite. 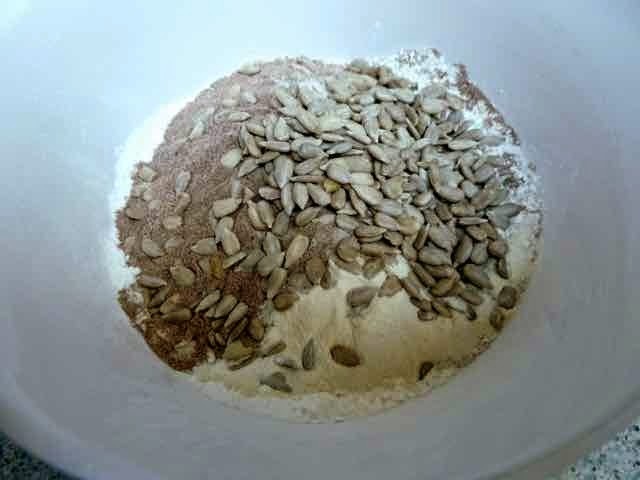 I like this recipe so much that I mixed a few bags of the dry ingredients to keep on hand so that I can quickly make a loaf of bread when I want to. 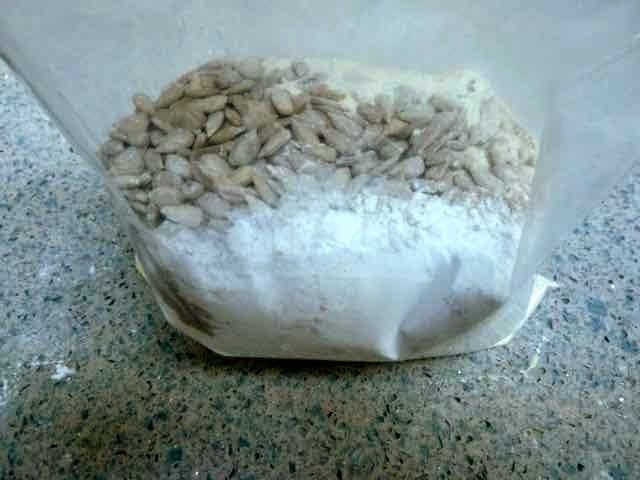 A bag of dry ingredients ready for bread baking at any time. 1 Tbs. + 1 tsp. 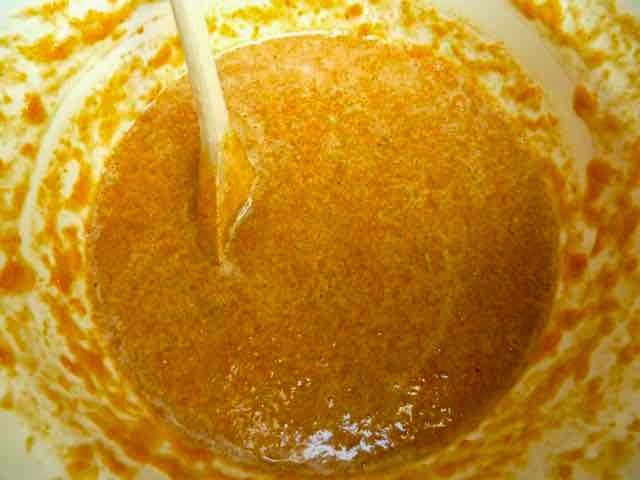 Mix in 1/4 cup to the batter. 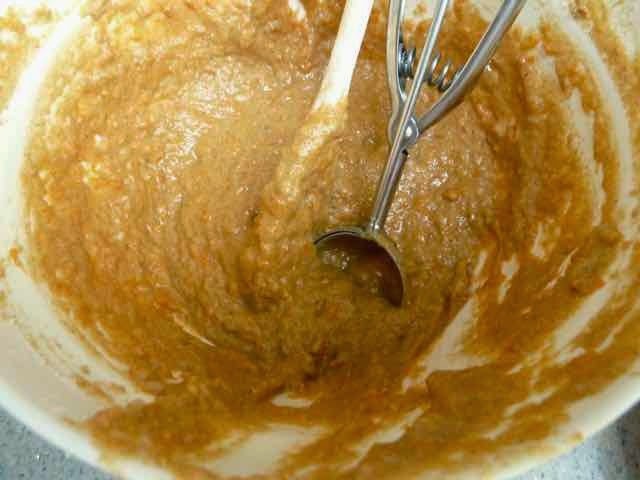 When the batter is finished mixing, top the loaf with 2 Tbs. of seeds if desired. Add all the wet ingredients to the pan and mix well. All wet ingredients mixed in the pan. In a large bowl mix all the dry ingredients (except for the optional 2 Tbs. 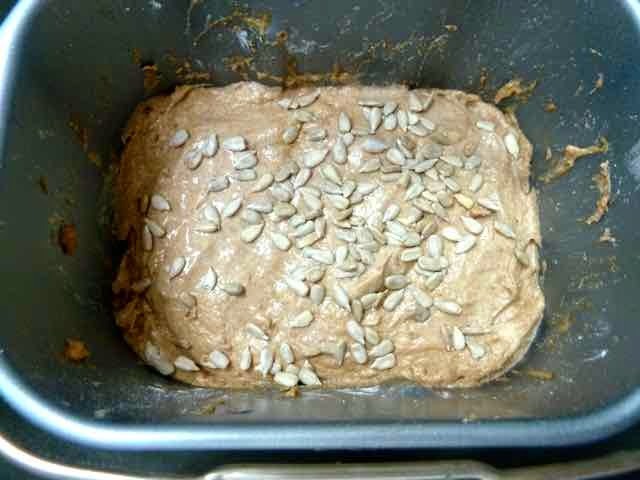 seeds to top the loaf). All the dry ingredients in the bowl. Add the dry ingredients on top of the wet ones in the pan. 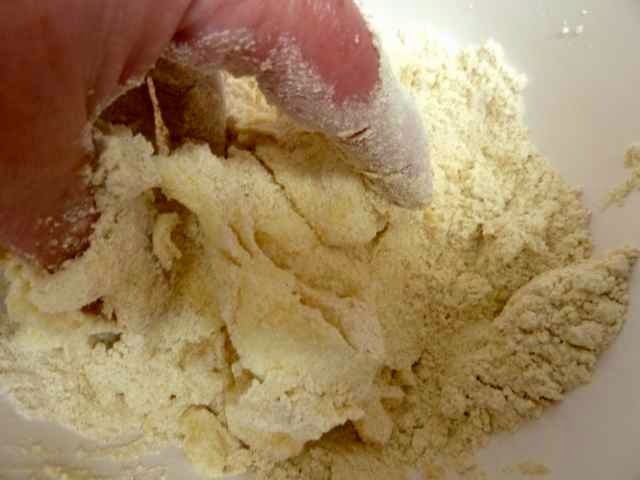 Make a well in the dry ingredients and add the yeast to the well. 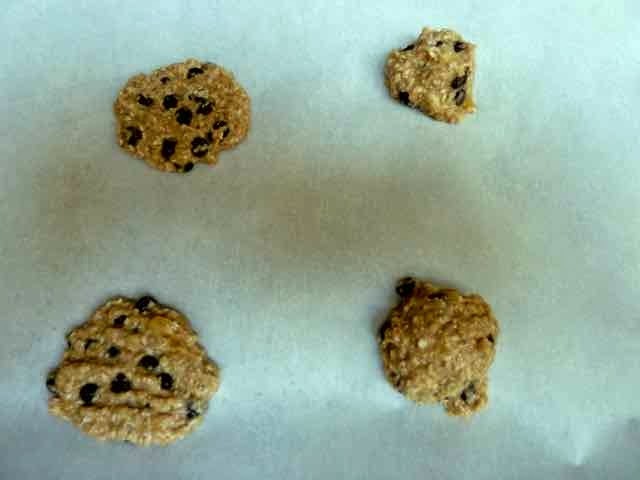 Dry ingredients on top of wet ones. Note the hole or well for the yeast. Yeast added to the well. Place the pan into the bread machine and snap it in place then close the lid. On my machine I cannot customize settings, I chose the cycle closest to these times which was the Sweet Bread Cycle. I pulled the pan out of the machine after the first rising cycles but before the punch down cycle. Then I reset the machine to the bake cycle. I put the pan back into the machine without snapping it into place (to prevent deflating the loaf) and then ran the bake cycle. I used the “light” color setting. During the first mixing cycle use a silicone spatula to scrape down the sides and bottom of the pan to help it along. Note the dry flour around the edges. Using a spatula to scrape down the sides while the machine is mixing. 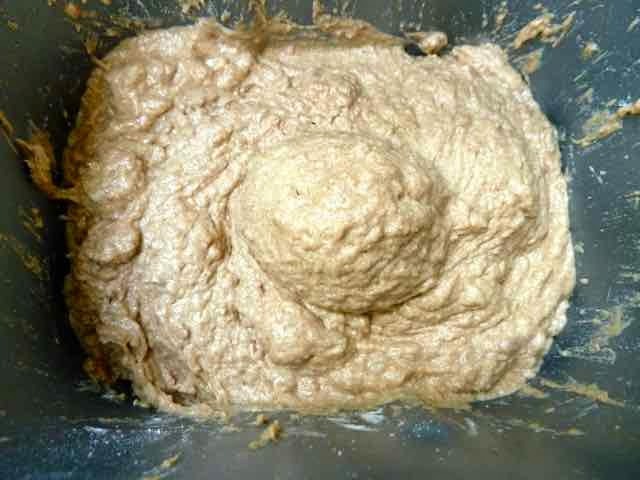 Dough after both mixing cycles have ended. After smoothing out the top of the loaf sprinkle the loaf with 2 Tbs. of seeds, if desired. Raw dough smoothed out and sprinkled with sunflower seeds. Bake the loaf as per instructions in step #7 above. Raw loaf after rising cycles. When done, invert the loaf onto a wire rack. Turn right side up and allow it to cool before slicing and eating. Take the loaf out of the pan as soon as you can. The crust will get soggy if it cools in the pan. Baked bread cooling on a rack. This bread keeps well at room temperature for 3 days. After this you will have to toast the bread before eating. Freeze slices for longer storage. Close up of a slice of fresh & delicious bread. 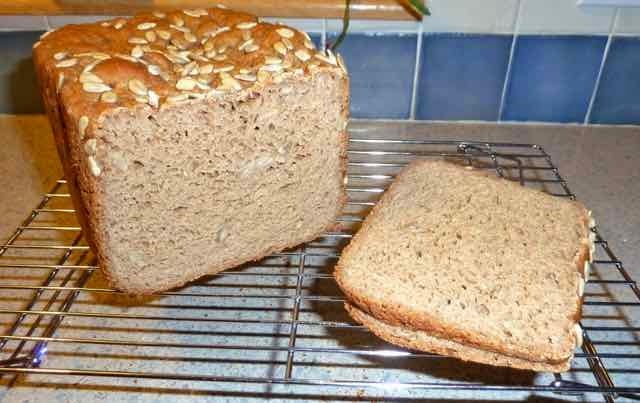 WHOLE GRAIN GLUTEN FREE BREAD IN A BREAD MACHINE Makes one 1.5 lb. 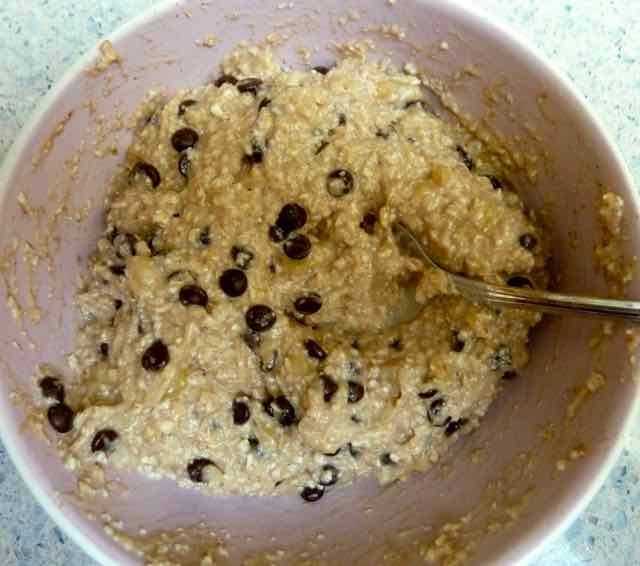 loaf Ingredients Wet 3 large Eggs 1 tsp. Apple Cider Vinegar 1/4 cup Vegetable Oil (canola, olive, coconut, etc.) 1 1/3 cups Milk or Nondairy Milk 1 Tbs. + 1 tsp. Honey 3 Tbs. 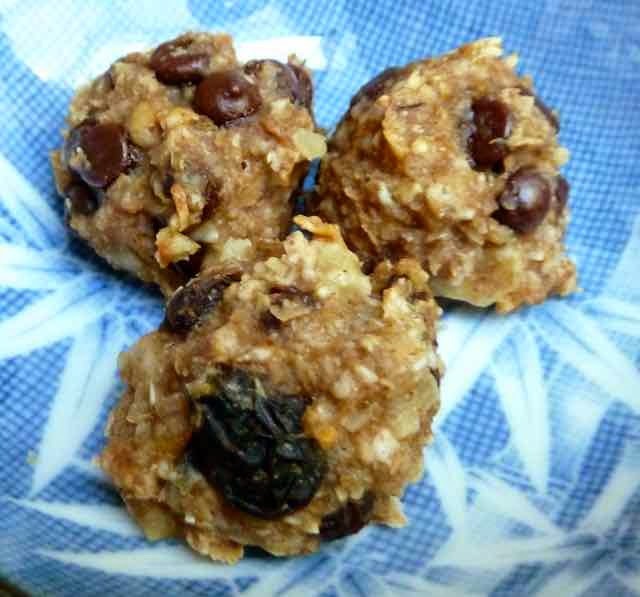 Brown Sugar Dry 1/2 cup Sorghum Flour (or millet, buckwheat, quinoa or amaranth flours) 1/2 cup Millet Flour (or sorghum, buckwheat, quinoa or amaranth flours) 1 cup Teff Flour (or brown rice or white rice flours) 1/2 cup Tapioca Flour (or other starch such as potato or arrowroot) 1/2 cup Corn Starch (or other starch such as potato or arrowroot) 1 Tbs. Xanthan Gum 1 1/2 tsp. Sea Salt 1/4 cup + 2 Tbs. 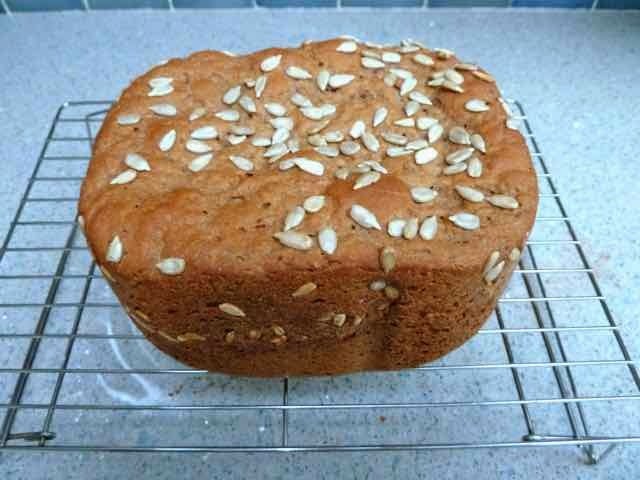 for top of loaf (optional) Seeds of choice: Sunflower, sesame or flax Mix in 1/4 cup to the batter. When the batter is finished mixing top the loaf with 2 Tbs. of seeds if desired. 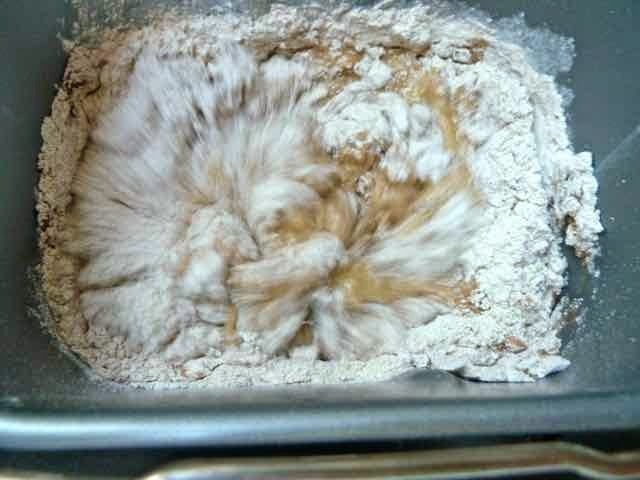 Yeast 2 1/4 tsp. Yeast (I used Saf-Instant) Directions Take the pan out of the bread machine. (This will save clean up of the machine from liquids and flours sneaking over the pan edges as you add them.) Add all the wet ingredients to the pan and mix well. In a large bowl mix all the dry ingredients (except for the optional 2 Tbs. 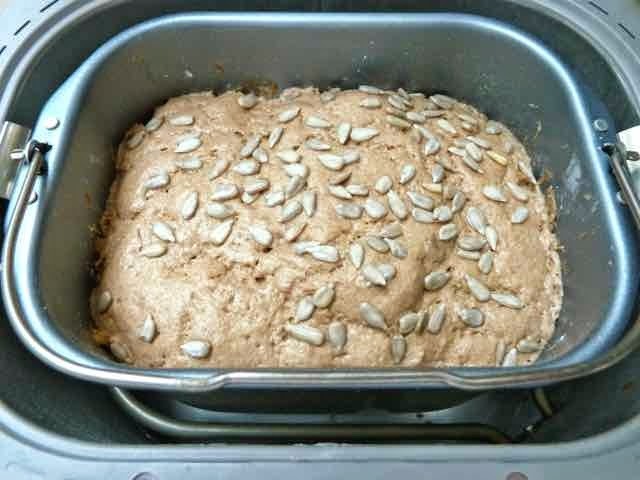 seeds to top the loaf). Add the dry ingredients on top of the wet ones in the pan. 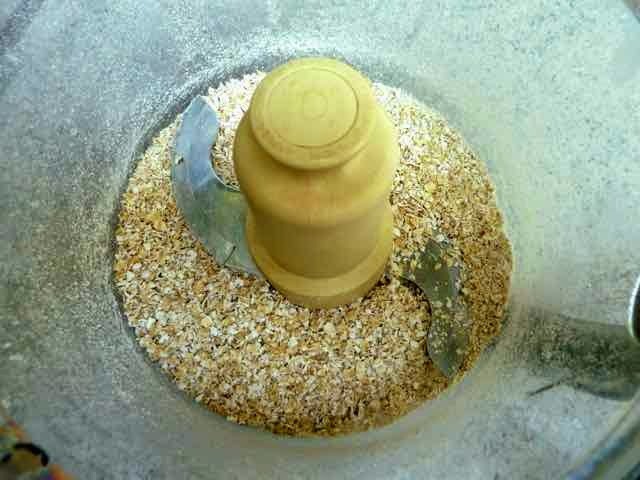 Make a well in the dry ingredients and add the yeast to the well. Place the pan into the bread machine and snap it in place then close the lid. Use the Gluten Free Bread Cycle on your machine or set the machine to these settings: No preheat Knead 1 - 5 minutes Knead 2 - 15 minutes Rise - 60 minutes Bake - 50 minutes Temp. 340℉ On my machine I cannot customize settings, I chose the cycle closest to these times which was the Sweet Bread Cycle. I pulled the pan out of the machine after the first rising cycles but before the punch down cycle. Then I reset the machine to the bake cycle. I put the pan back into the machine without snapping it into place (to prevent deflating the loaf) and then ran the bake cycle. I used the “light” color setting. During the first mixing cycle use a silicone spatula to scrape down the sides and bottom of the pan to help it along. After the mixing cycles are done, reach in and pull out the mixing blade. Then smooth out the top of the loaf with wet hands or a silicone spatula. No photos of this step because both hands were too messy to hold a camera. (You do not have to do this step, it just leaves a smaller hole on the bottom of the baked loaf.) After smoothing out the top of the loaf sprinkle the loaf with 2 Tbs. of seeds, if desired. Bake the loaf as per instructions in step #7 above. When done, invert the loaf onto a wire rack. Turn right side up and allow it to cool before slicing and eating. Take the loaf out of the pan as soon as you can. The crust will get soggy if it cools in the pan. This bread keeps well at room temperature for 3 days. After this you will have to toast the bread before eating. Freeze slices for longer storage. ***UPDATE After making this recipe several times I have found some things to work really well: 1) Most important is to warm up the milk or dairy free milk to about 110℉. This gets a great rise on the bread and makes it lighter and fluffier. 2) Using the Express Bake Cycles on the machine works really well. I found the 58 minute Express Bake Cycle to work the best. 1) Most important is to warm up the milk or dairy free milk to about 110℉. This gets a great rise on the bread and makes it lighter and fluffier. 2) Using the Express Bake Cycles on the machine works really well. I found the 58 minute Express Bake Cycle to work the best. I used to love Lindy’s cheesecake. Lindy’s is a New York City deli famous for their NY style cheesecake. 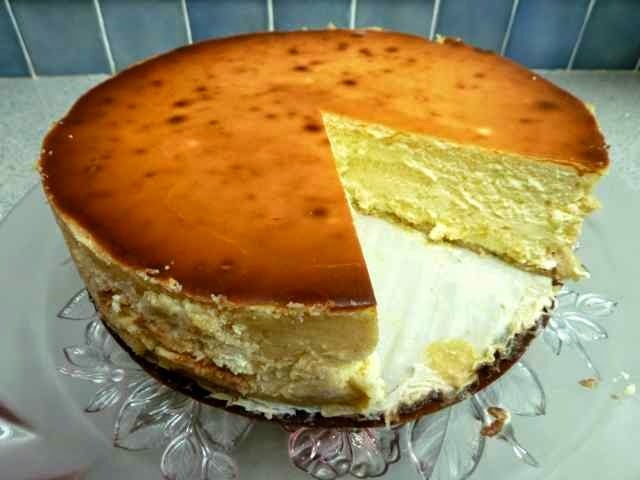 NY cheesecakes are typically dense and various landmark eateries have become famous for their take on this dessert. 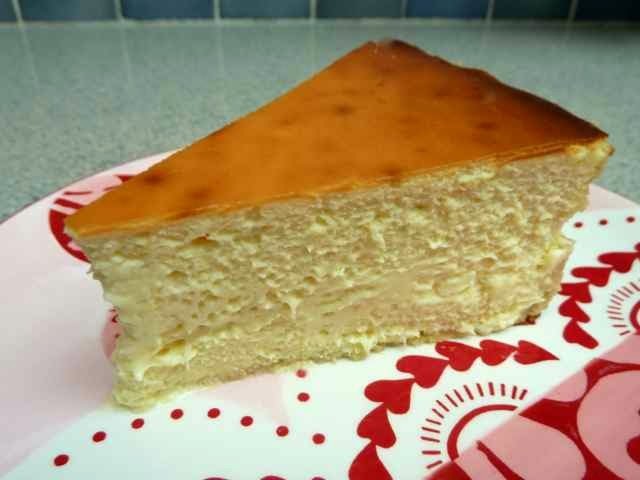 Lindy’s cheesecake differs from the others in the type of crust and the flavoring. 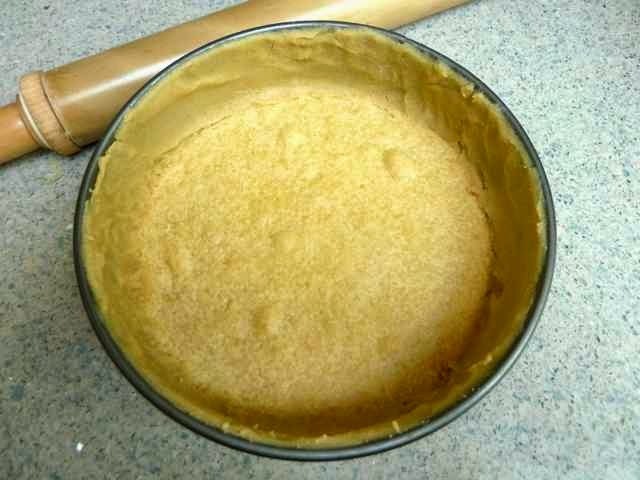 Most cheesecakes have a graham cracker crust. Lindy’s has a soft cookie crust made from homemade dough. The filling is very creamy and has orange zest as well as the usual lemon zest used in most recipes. 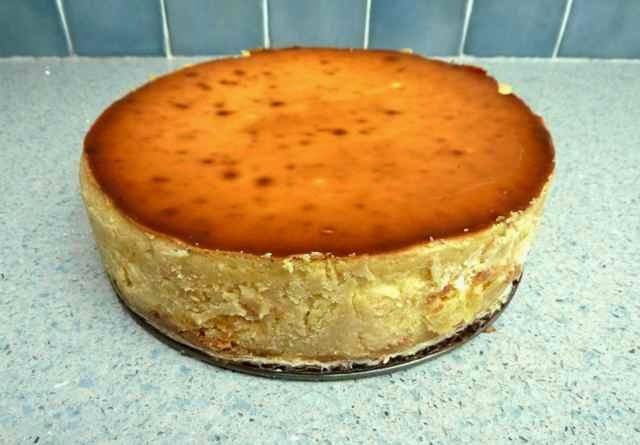 I knew that if I wanted some Lindy’s cheesecake I would have to make it myself, no GF version available at the deli. 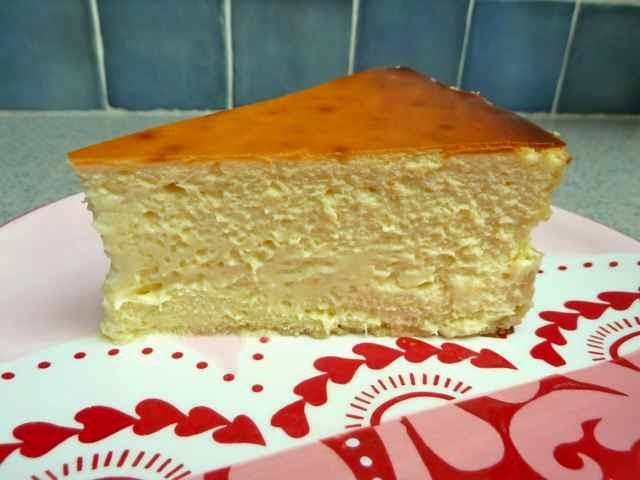 Cheesecake is not hard to make, it is tricky to get it to just the type of consistency that you like and to keep it from cracking on top. No matter if you undercook, slightly overcook or get cracks on top, the cheesecake will still taste great and be eaten up appreciatively. I followed the recipe as written, making the necessary GF replacements and using the indicated baking time. I think that I would have liked the texture better if I had baked it a bit longer. 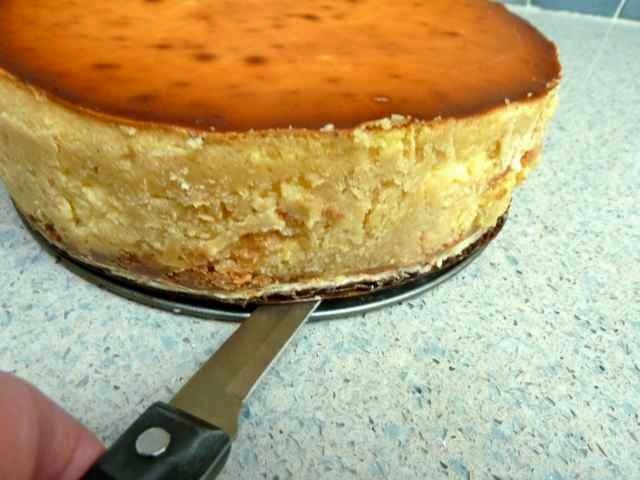 You can tell if the cheesecake is done if you move it and the center 2-3 inches wobble or jiggle. I shook mine while on the oven rack, it did not jiggle and I worried that I overcooked it. So I turned the oven off and allowed the cake to cook down in the oven for about 40 minutes with the door ajar. When I took it out of the oven, after 40 minutes, I realized that the center 6 inches of the cake was jiggling. Too late to do anything at that point. The texture was very creamy and light, not the denseness I was hoping for. No one complained and only raved about the taste and texture as they gobble it up, so no problems. Next time I will check for wobbliness by taking the hot cake out of the oven and gently moving it while holding it in my hands, not shaking it on the oven rack. To keep the cake from forming cracks be aware of a few things. Don’t overcook the cake. A dry cake will form a large crack. Don’t open the oven door if you can help it, or slam it shut while baking. 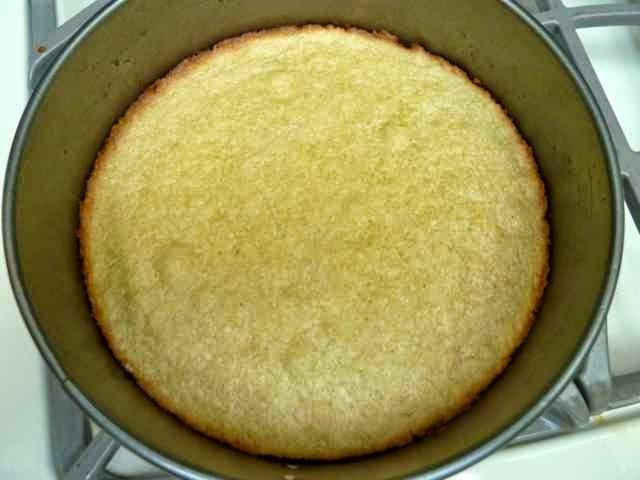 Grease the sides of the pan well to help the cake pull away from the sides of the pan when it cools. This will keep the center of the cake from pulling apart while cooling. 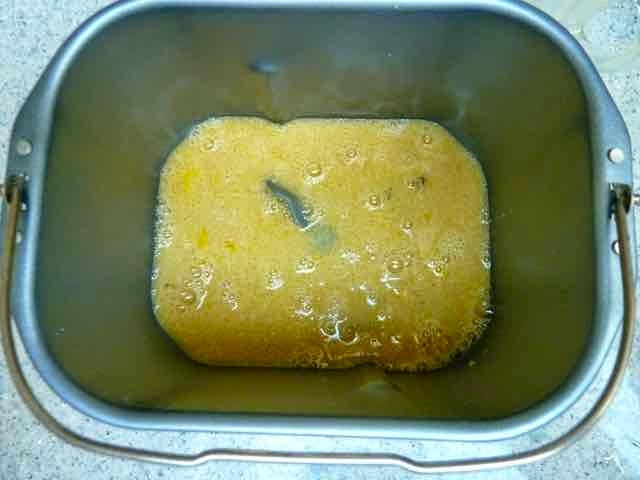 Bake the cake in a water bath (Bain-Marie) to allow the cake to cook more evenly and slowly. Cool down the cake gradually. I like to turn off the oven and allow the cake to cool down with the door ajar for 40 minutes and then move the cake to a rack to cool completely before covering it and chilling it in the fridge. For a creamy texture, before you add the eggs, beat the cream cheese filling until very smooth and no lumps remain. Then mix in the eggs one at a time. Don’t worry about surface cracks, just cover them up by spreading a layer of sour cream over the top of the cake. You can also make a fruit sauce for the top to cover them up. Be aware that purists prefer plain cake and any sauce should be served on the side. Because oven temperatures vary it can be difficult to figure out the correct baking time. 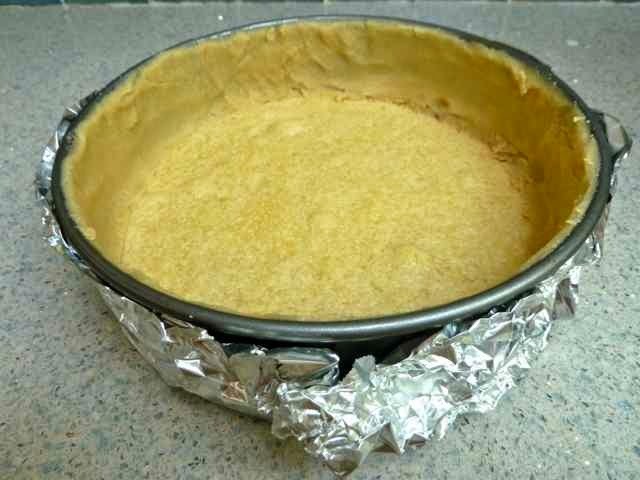 If the top of the cake is getting too brown, lay a piece of foil gently over the top and carefully close the oven door. 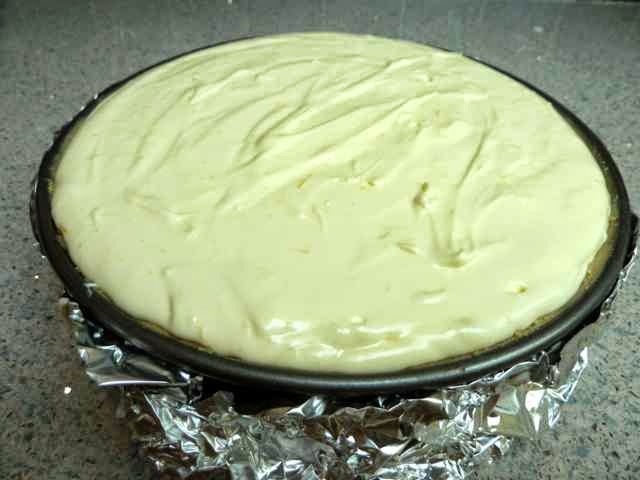 If your oven tends to cook things faster than the recipe indicates then check the cheesecake sooner than the total cooking time and if done then turn off the oven and start the cool down with the oven door ajar. If your oven tends to take longer than recipes indicate then check for doneness at the indicated baking time and, if necessary, continue to bake until done. Combine the flours, xanthan gum, salt, sugar and lemon zest and mix well. 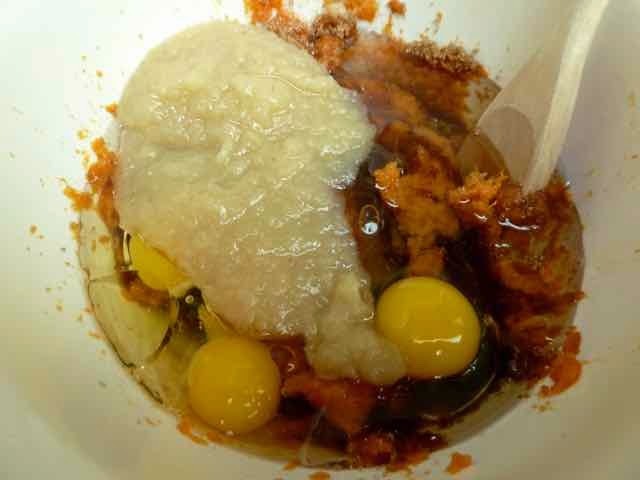 Add the egg yolk and butter and mix together with your fingers until a dough is formed. Adding butter and yolk to flour mixture. Mixing the dough with my fingers. Divide the dough into two parts, form two disks and wrap each disk in plastic wrap. Chill the dough disks for 1 hour. 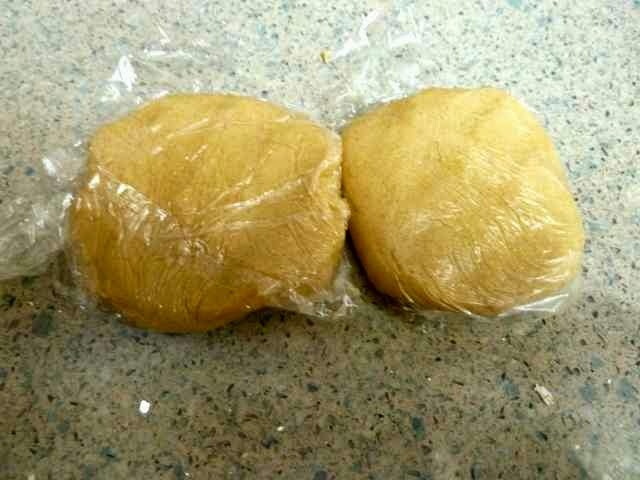 Two disks of dough wrapped and ready to chill. Prepare a 9-inch springform pan by lining the bottom with a cardboard round and topping the round with a circle of parchment paper. This will allow you to remove the cheesecake from the pan and move it (in one piece) to a serving dish. and putting a parchment circle on top. 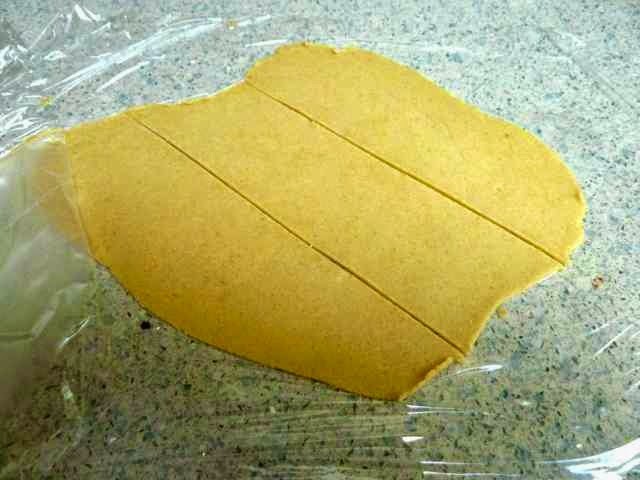 The parchment will keep the crust from sticking. The cardboard will allow you to move the cake to a plate more easily. Grease the parchment paper with butter. After the dough has chilled preheat the oven to 400℉. 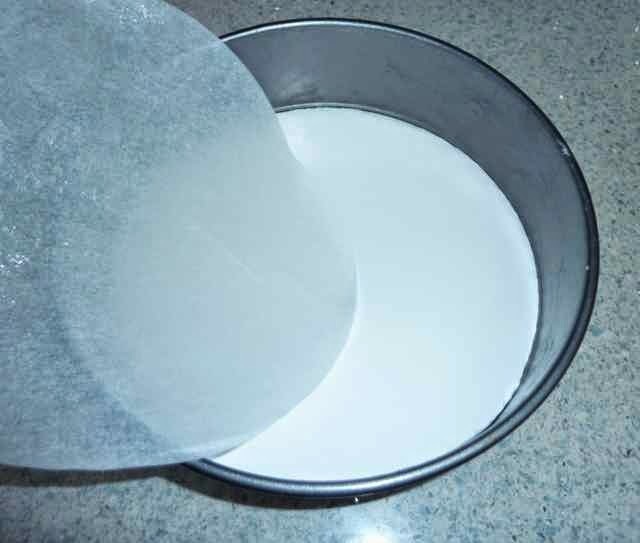 Take one disk out of the fridge and roll it out into a circle between two pieces of plastic wrap. The dough should be about 1/8 inch thick. 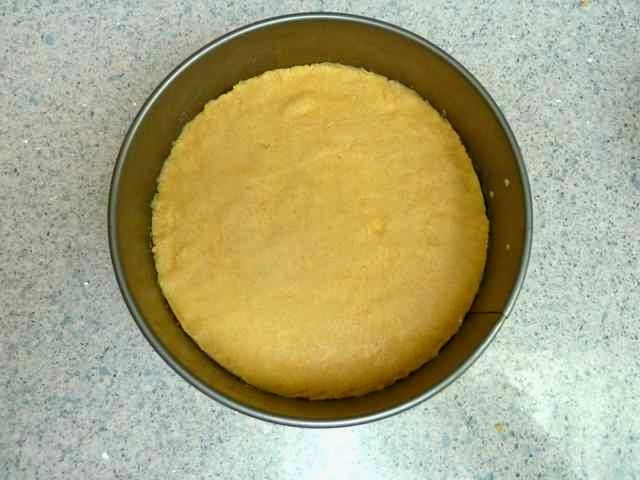 Remove the top layer of plastic and press the pan onto the dough to create a circle indent. Remove the dough from the outside of the dough circle. Invert the dough circle, still with the plastic on the bottom, on to the parchment round on the bottom of the springform pan. Gently press out any bubbles. Remove the plastic wrap. Bake for about 8-10 minutes until the dough is lightly browned. Set on a rack to cool or speed up the process by putting the pan in the fridge. Raw dough on bottom of pan. Increase the oven temperature to 500℉. When completely cooled, grease the sides of the pan well with butter. Line the sides of the pan with the remaining dough. I found it easiest to roll out the dough and cut it into strips. I then pieced, patched and pressed the strips around the sides of the pan. Make sure to seal the raw dough around the edges of the cooked bottom round of dough. It does not have to look perfect, no one will ever see it, just be sure to cover the sides completely. Rolled dough ready to be pressed along the side of the pan. Side dough pieced and pressed around the pan. Note the raw dough is pressed to the cooked bottom. Prepare the water bath. You will need a baking pan that will hold the cake and allow enough boiling water go 2-3 inches up the outside of the cake pan. Boil enough water to fill the pan water bath pan 2-3 inches. Use 2 layers of heavy duty aluminum foil to cover the bottom and sides of the springform pan. This will prevent the water from seeping into the bottom of the cake. Place the baking pan that will hold the water on the stove top. 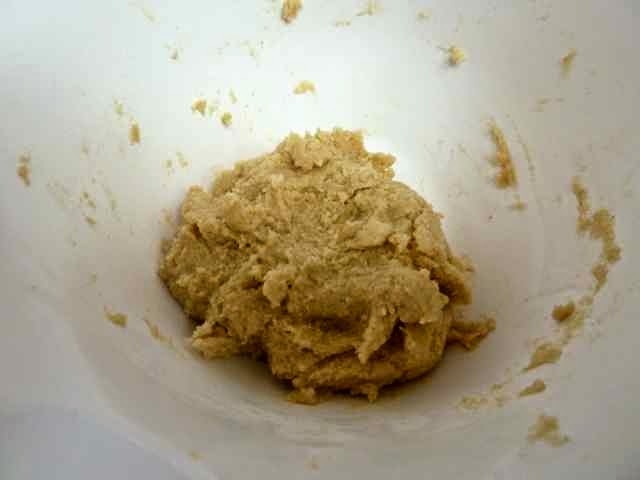 In the bowl of a stand mixer beat the cream cheese, sugar, corn starch, zests and vanilla until very smooth and no lumps of cream cheese remain. Add the eggs and yolks, one at a time, mixing well after each addition. Stir in the cream until smooth. Place the empty springform pan into the pan that will hold the water. Pour the filling into the springform pan. The filling will mound slightly over the top of the pan. Pan with filling doming a bit over the top. It will not overflow and does sink a bit after baking and cooling. Carefully pour the boiling water into the larger empty pan, taking care not to get water on to the cake. Place the cake in the water bath pan into the oven. Bake for 10 minutes or until the top begins to brown. Reduce the oven temperature to 250℉ and bake another hour. If the top is getting too brown during baking, gently lay a piece of foil on the cake, and carefully close the oven door. If your oven tends to cook things faster than recipes call for, then check the cake 10 minutes before the end of the recommended cooking time. If your oven tends to take longer to bake things than recipes indicate then check the cake for doneness at the recommended time. Check for doneness by taking it out of the oven and gently moving the cake. The center 2-3 inches of the cake should jiggle when done. If a larger area is jiggling return the cake to oven to continue baking and check again in 5-10 minutes. When done, turn the oven off, leave the oven door ajar, and let the cake cool down for 40 minutes in the oven. Slowly cooling down the cake will prevent cracking. After cooling in the oven for 40 minutes, remove the cake to a wire rack to cool completely at room temperature. Cake in the pan after chilling overnight. Cover and chill for 6-8 hours or overnight. When ready to serve, run a knife around the edge of the cooled cake. Then carefully remove the side ring from the pan. After the side ring is removed. I should have run the knife after chilling. I did it right out of the oven and it broke a bit. Use a knife to lift the edge of the cardboard bottom from the pan. Slip your hand under the cardboard and move the cake to a serving dish. Using a knife to lift the cardboard enough to slip your hand underneath. For clean looking slices, wipe the knife blade before each cut. Refrigerate leftovers. For longer storage you can freeze well wrapped slices or the entire cake. Thaw in the fridge before serving. A view of the bottom crust. 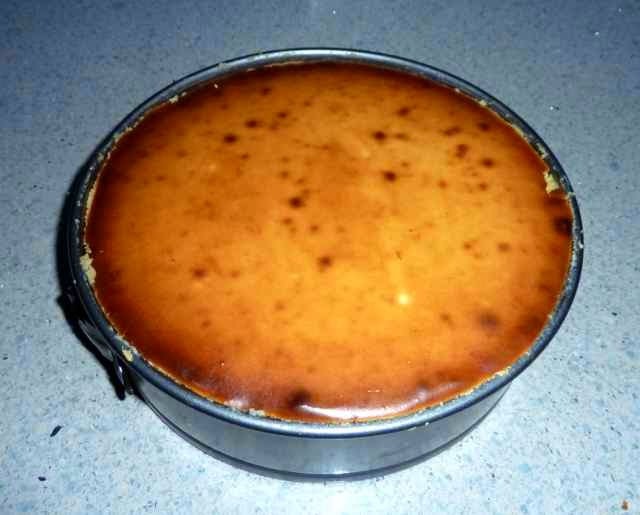 GLUTEN FREE LINDY’S CHEESECAKE Makes one 9-inch cheesecake Ingredients CRUST 1/2 cup Sorghum Flour 1/4 cup Tapioca Flour 1/4 cup Chickpea Flour 1/2 tsp. Xanthan Gum 1/4 cup Sugar 1 tsp. 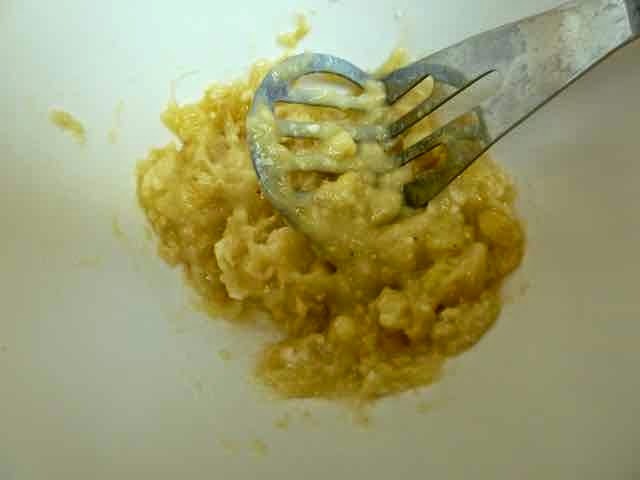 Lemon Zest 1/4 tsp. 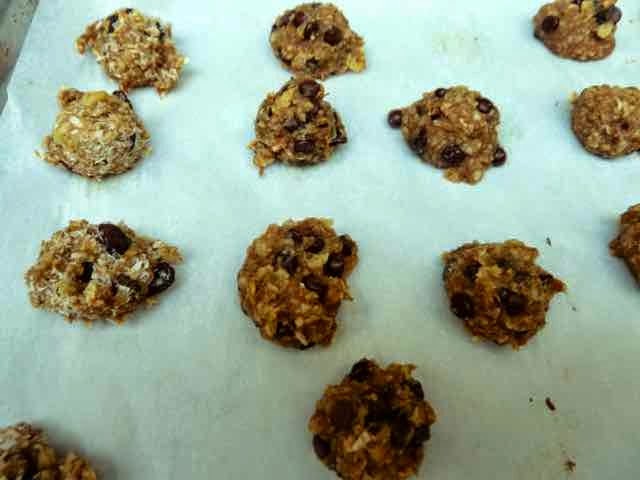 Sea Salt 1 large Egg Yolk 8 Tbs./1 stick/1/2 cup Unsalted Butter at room temperature FILLING 2 1/2 lbs./40 oz./five 8 oz. packages Cream Cheese (full fat) at room temperature 1 1/4 cup Sugar 3 Tbs. Corn Starch (or other starch flour such as arrowroot or tapioca) 1 1/2 tsp. Orange Zest 1 1/2 tsp. Lemon Zest 1/2 tsp. 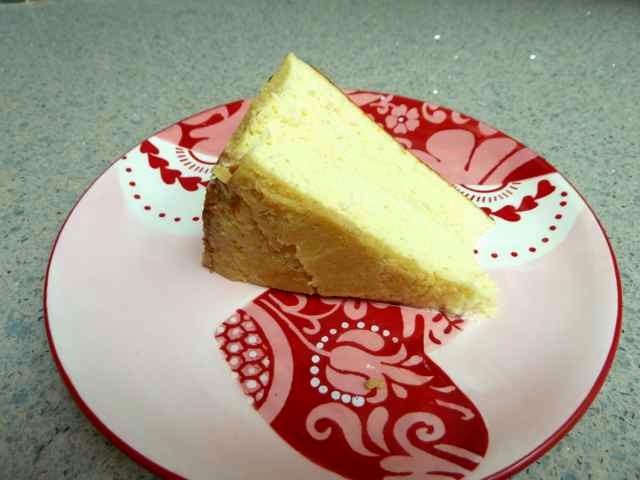 Vanilla Extract 5 large Eggs 2 large Egg Yolks 1/4 cup Heavy Cream Directions First make the crust: Combine the flours, xanthan gum, salt, sugar and lemon zest and mix well. Add the egg yolk and butter and mix together with your fingers until a dough is formed. Divide the dough into two parts, form two disks and wrap each disk in plastic wrap. Chill the dough disks for 1 hour. Prepare a 9-inch springform pan by lining the bottom with a cardboard round and topping the round with a circle of parchment paper. This will allow you to remove the cheesecake from the pan and move it (in one piece) to a serving dish. Grease the parchment paper on the bottom with butter. After the dough has chilled preheat the oven to 400℉. Take one disk out of the fridge and roll it out into a circle between two pieces of plastic wrap. The dough should be about 1/8 inch thick. 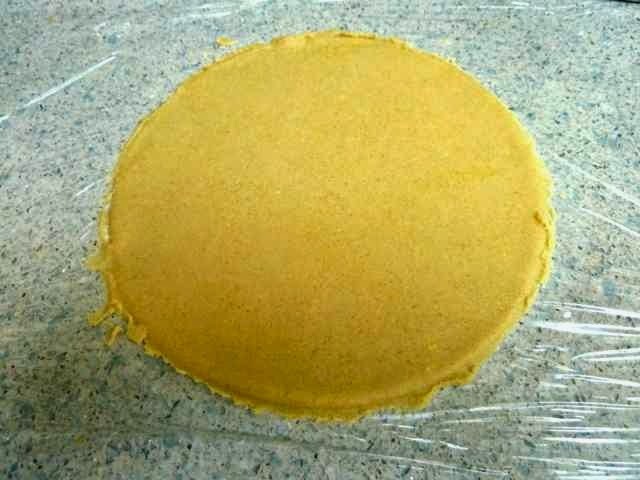 Remove the top layer of plastic and press the pan onto the dough to create a circle indent. Remove the dough from the outside of the dough circle. Invert the dough circle, still with the plastic on the bottom, on to the parchment round on the bottom of the springform pan. Gently press out any bubbles. Remove the plastic wrap. Bake for about 8-10 minutes until the dough is lightly browned. Set on a rack to cool or speed up the process by putting the pan in the fridge. Increase the oven temperature to 500℉. When completely cooled, grease the sides of the pan well with butter. Line the sides of the pan with the remaining dough. I found it easiest to roll out the dough and cut it into strips. I then pieced, patched and pressed the strips around the sides of the pan. Make sure to seal the raw dough around the edges of the cooked bottom round of dough. It does not have to look perfect, no one will ever see it, just be sure to cover the sides completely. Set in the fridge to chill while you make the filling. Prepare the water bath. You will need a baking pan that will hold the cake and allow for enough boiling water to go 2-3 inches up the outside of the cake pan. Boil enough water to fill the water bath pan 2-3 inches. Next make the filling: Use 2 layers of heavy duty aluminum foil to cover the bottom and sides of the springform pan. This will prevent the water from seeping into the bottom of the cake. Place the baking pan that will hold the water on the stove top. 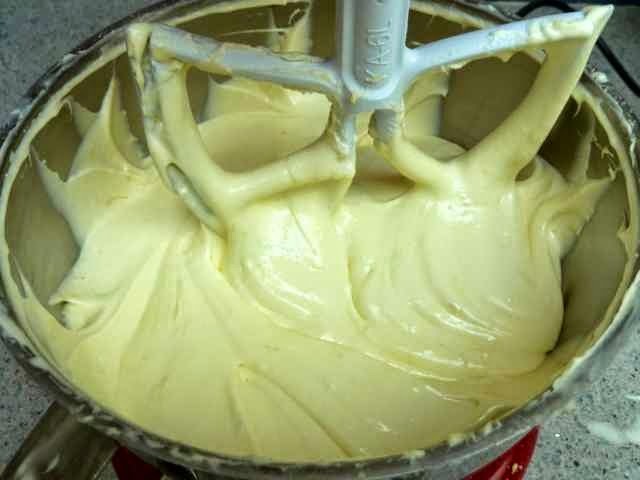 In the bowl of a stand mixer beat the cream cheese, sugar, corn starch, zests and vanilla until very smooth and no lumps of cream cheese remain. Add the eggs and yolks, one at a time, mixing well after each addition. Stir in the cream until smooth. Place the empty springform pan into the pan that will hold the water. Pour the filling into the springform pan. The filling will mound slightly over the top of the pan. Carefully pour the boiling water into the larger empty pan, taking care not to get water on the cake. Place the cake in the water bath into the oven. Bake for 10 minutes or until the top begins to brown. Reduce the oven temperature to 250℉ and bake another hour. If the top is getting too brown during baking, gently lay a piece of foil on the cake, and carefully close the oven door. If your oven tends to cook things faster than recipes call for, then check the cake 10 minutes before the end of the recommended cooking time. If your oven tends to take longer to bake things than recipes indicate then check the cake for doneness at the recommended time. Check for doneness by taking it out of the oven and gently moving the cake. The center 2-3 inches of the cake should jiggle when done. If a larger area is jiggling return the cake to oven to continue baking and check again in 5-10 minutes. When done, turn the oven off, leave the oven door ajar, and let the cake cool down for 40 minutes in the oven. Slowly cooling down the cake will prevent cracking. After cooling in the oven for 40 minutes, remove the cake to a wire rack to cool completely at room temperature. Cover and chill for 6-8 hours or overnight. When ready to serve, run a knife around the edge of the cooled cake. Then carefully remove the side ring from the pan. Use a knife to lift the edge of the cardboard bottom from the pan. Slip your hand under the cardboard and move the cake to a serving dish. For clean looking slices, wipe the knife blade before each cut. Refrigerate leftovers. For longer storage you can freeze well wrapped slices or the entire cake. 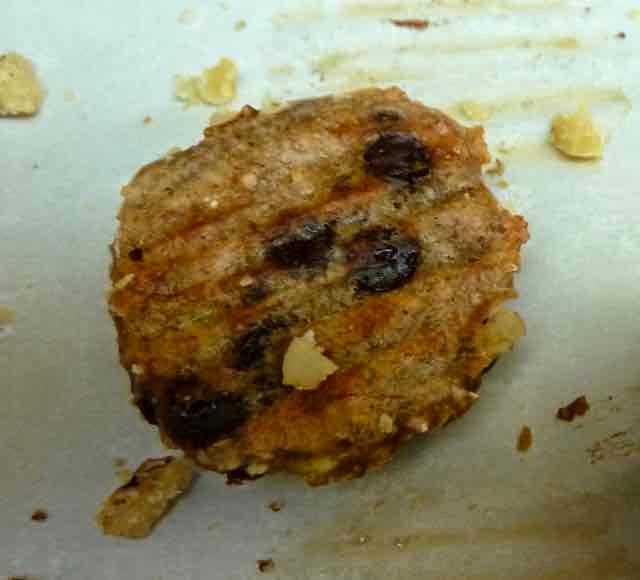 Thaw in the fridge before serving.